It is no fun dealing with the flu and possible dehydration, which can be a very serious condition. Do you reach for Pedialyte or Gatorade to replace electrolytes and rehydrate? Pedialyte has become the go-to drink for sick babies and children since being introduced in 1966 by Abbott as the first ready-to-feed oral electrolyte solution. Abbott also manufactures Similac, Pediasure, Ensure and other similar beverages. These products contain many sugars, artificial sweeteners, preservatives, dyes, GMO ingredients and chemicals. Are You Man Enough for Pedialyte? Since the 1980s Pedialyte’s off-label use in the sports arena has grown. It is now fashionable to pay twice as much for a bottle of Pedialyte than to drink Gatorade, which has similar ingredients. Oh my word! 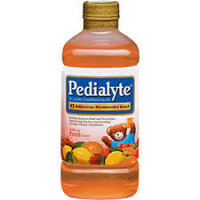 What did parents and athletes do before Abbott saved the day by inventing Pedialyte? Somehow a highly processed drink with dye and artificial ingredients has been raised to the status of Holy Health Water. I observed a recent Facebook row with an impassioned volley of comments about . . . . Pedialyte. Google the phrase “addicted to Pedialyte” and you’ll find some strange things happening in the world. Why are doctors prescribing Pedialtye for children when several of the ingredients in Pedialyte are health-damaging? Sweetener: Dextrose (a simple sugar, glucose) made from genetically modified corn (unless organic dextrose is used). Artificial Flavor Russell Blaylock, MD and neurosurgeon has written extensively about the damage that artificial ingredients and flavor do to the brain, impacting memory, mood and behavior. Sucralose is an artificial sweetener made from chlorine, a known carcinogen. Sucralose (Splenda®) is a chlorocarbon and is more accurately compared to ingesting tiny amounts of chlorinated pesticides. it causes up to 40% shrinkage of the thymus: a gland that is the very foundation of our immune system. Sucralose also causes swelling of the liver and kidneys, calcification of the kidney, fertility issues in male rats, and gastrointestinal problems in pregnant rats. headaches, depression, nausea, mental confusion, liver and kidney problems, visual disturbances, and cancer in humans. May lead to temper tantrums, aggressive behavior, fidgeting, anxiety, and inability to concentrate. I prefer plain Real Coconut Water from Taste Nirvana – delish! Coconut water is the water from young coconuts (not hairy brown coconuts). It will hydrate the body and replenish electrolytes. Coconut water has been used in remote locations as an intravenous hydration fluid (don’t try that with Pedialyte, I’m pretty sure you will die). Coconut water is natural, yes children can drink it! Warm the water, stir in honey to dissolve. Add lemon juice and Real Salt (do not use table salt or pure white “sea salt” as these are missing the natural minerals). Real Salt’s unique pinkish appearance and flecks of color come from more than 60 naturally occurring trace minerals. Yes, you need the right salt! 1/4 tsp Redmond’s Real Salt provides 530 mg sodium. If you are exercising moderately, or for half hour or less, you can easily hydrate with plain water. If you’re on a long run, hike, or bike ride and your legs begin cramping, rip open a Real Salt sample packet, dump it on your tongue, and chase it down with a little water. Your cramping will stop in mere seconds!